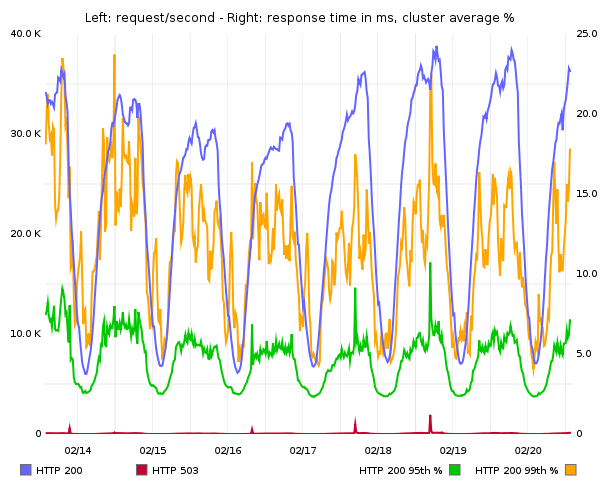 This entry was posted in Uncategorized and tagged graphing, graphite, monitoring, Open Source, Performance, response time, statsd, tricks, varnish by jiboumans. Bookmark the permalink. i get some errors when trying to acces my api key…where can read about this type of issues? Hi Jos, thank you for creating the modules and for sharing. Could you share you thoughts on the meaning of handling time? What could be practical reason to measure it. As I understand it it is duration between when session was opened and when particular request processing was started. So if you have sess_timeout set to, say, 60s. handle_time will vary from 0s to 60s and I’m not sure what it means for me. May i ask what kernel tuning have you done to achieve 40,000 requests/second?